Campaigners opposed to the construction of Renzo Piano’s Paddington Cube have insisted the fight over planning principles raised by the controversial development will continue, reports BD. Developer Sellar Group said this week that construction work had begun on the £825m office retail and leisure development next to Paddington Station. The firm added that demolition of an Edwardian former Royal Mail sorting office that is one of the scheme’s most controversial elements would be complete by the end of 2018. But campaign group Save Britain’s Heritage, which has long opposed the development – approved by Westminster Council in 2016 – said it had been given a date in July when the Court of Appeal would hear its grievances over former communities secretary Sajid Javid’s handing of the case. On 29 November 2017 The High Court dismissed the legal action by SAVE Britain’s Heritage challenging the Secretary of State over his refusal to call in the Paddington Cube proposals for public inquiry. SAVE’s challenge focuses on the government’s refusal to give reasons for the decision not to call-in the highly controversial west London proposals. UK Communities Secretary Sajid Javid has issued an Article 31 direction, preventing Westminster City Council from formally granting planning permission to Renzo Piano’s building. 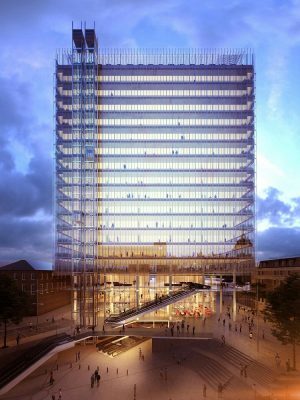 The communities secretary has issued a holding direction preventing the west London borough from formally issuing planning permission for this controversial office-led redevelopment of a former Royal Mail site next to Paddington Station by the celebrated Italian architect. Conservation group SAVE Britain’s Heritage has urged UK communities secretary Sajid Javid to launch a public inquiry into Italian architect Renzo Piano’s controversial ’Paddington Cube’ reports the Architects’ Journal. The charity is lobbying for Javid to halt the project, for Sellar Property Group, to allow for the independent public inquiry to take place. The £775 m 14-storey office block scheme replaced an earlier concept featuring a 72-storey skyscraper nicknamed the Paddington Pole. That proposal was was ditched in January 2016 following criticism. However, both SAVE and Historic England, the government’s statutory adviser on the historic environment, remain unhappy with the revised proposals. SAVE accused Westminster Council’s former cabinet member for the built environment Robert Davis of presenting the scheme to other committee members in a ‘partisan one-sided manner’. The group claims that Davis, former chair of the planning committee, disregarded ‘significant objections’ and noted how he had previously voiced his support for the scheme in the media. Property tycoon Irvine Sellar today said his new £775 million Cube development will help to give “tatty” Paddington a Shard-style shot in the arm, reports the London Evening Standard today. The 19-storey glass cube by architect Renzo Piano was last night given approval by Westminster Council. 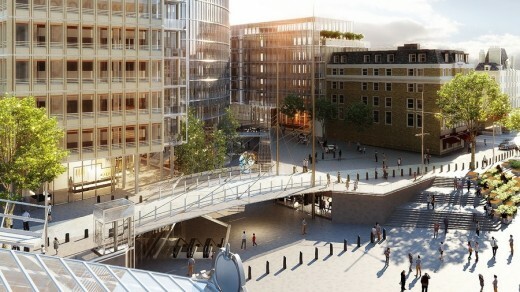 The project is set to completely regenerate the area, providing more than an acre of redesigned public space with £2million of art in a piazza, shops, restaurants, offices and underground access to a new Bakerloo line tube station. Last night the developers made an “eleventh hour” offer to build and fund a new road for ambulances accessing St Mary’s Hospital which helped clinch planning approval. Great Western Developments promise the scheme will ease congestion and bring 4,000 jobs as well as £65m investment in public space and infrastructure. Historic England is still objecting to designs by celebrated Italian architect Renzo Piano for a new building next to Paddington station because of the impact it will have on nearby listed buildings, reports Building Design. Following the scrapping of a skyscraper, Renzo Piano designed a 14-storey office building, titled the Cube. But Historic England has written to planning authority Westminster council and said the design is at odds with the character of the area, which includes the Bayswater Conservation Area, and the grade I listed Paddington station as well as the grade II St Mary’s Hospital and another nearby grade II listed building, the Great Western Hotel. Sellar Property switched to offices from flats because offices are less contentious, according to architect William Matthews, reports Building Design (BD). Commercial buildings prompt fewer complaints than luxury flats apparently. Shard architect William Matthews was drafted in to get heavily revised scheme through planning. His architecture practice William Matthews Associates has been working on the public realm with masterplan experts BDP. 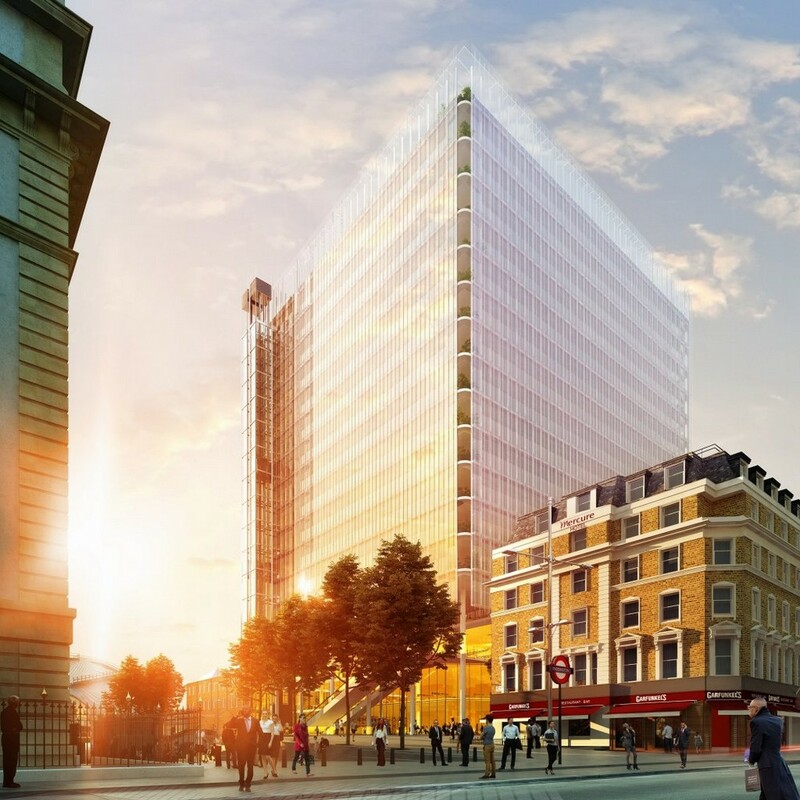 Italian architect Renzo Piano has revealed his dramatically reduced replacement for the Paddington Pole. The giant cube is just a fifth the height of the original proposal. 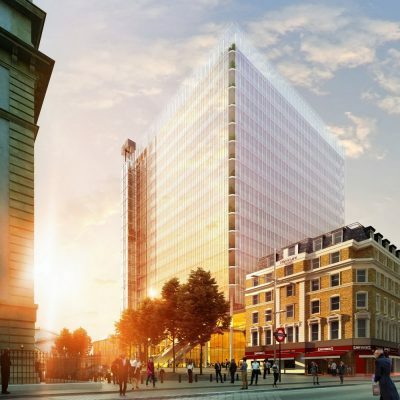 The new plans for the £775m redevelopment of the former Royal Mail sorting office next to Paddington Station have turned the 72-storey pole into a 14-storey cube building. It emerged that Shard architect William Matthews – who set up his own architecture practice after leaving Renzo Piano Building Workshop (RPBW) once the Shard opened – was also involved in the design. The Paddington Cube also removes the 330 luxury flats that would have capped the tower. 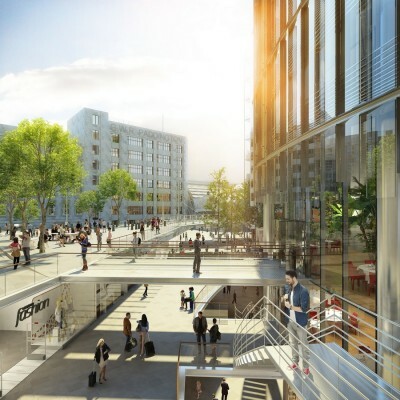 Instead it contains offices and retail lifted 12m above 1.35 acres of new public realm. 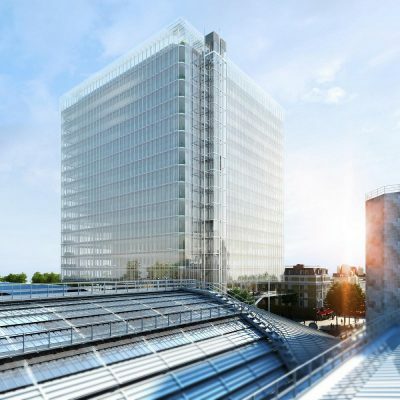 A fresh public consultation on revised plans for the site of Renzo Piano’s abandoned Paddington Pole in west London is due to be launched later this month, reports Building Design. 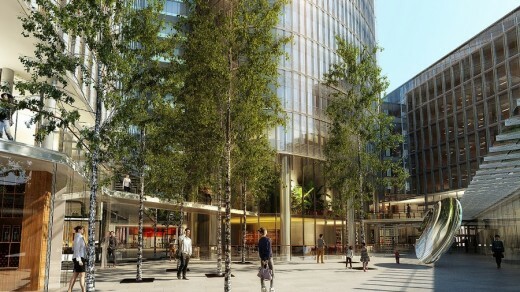 Now renamed the Paddington Quarter, developer Sellar Property, which is working on the scheme with Great Western Development, a subsidiary of Singapore firm Hotel Properties, said it will hold the consultation on June 24, 25 and 27. Celebrated Italian architect Renzo Piano is still the architect on the scheme. In a statement, Sellar said it expected to submit a new planning application to Westminster council by the end of September. No images or details have been released yet. Lobby group Create Streets has launched a design contest for the site of Renzo Piano’s Paddington Pole tower, reports the Architect’s Journal. The group is seeking proposals for the wider area including where the 72-storey tower for developer Irvine Sellar was set to stand. However the likelihood in this case – like so many other planning applications – is that the developer starts out ‘big’ (in this case ‘high’) then reduces to create a proposal that is harder to defeat, in that it is so much better than the initial design. That doesn’t mean this isn’t a good initiative: e-architect tentatively support this design contest, it is always good to encourage more engagement and for a key site like this the alternative competition can be a useful vehicle. We tried this in Edinburgh many years ago with an ideas contest for the Cowgate fire site. However the flipside is lots of design time gets sucked into proposals that have no chance of being built: the developer’s architects will no doubt already be very carefully redesigning the Paddington Place tower to find just the right height! The plans for a 254m-tall skyscraper by Shard-designer Renzo Piano were withdrawn from planning in February. Protests from Skyline and Historic England prompt developers to withdraw planning application for 72-storey tower in west London, reports The Guardian. 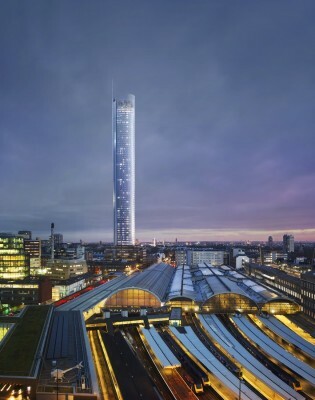 Campaigners have declared victory after developers withdrew plans for this 254m (830ft) tower dubbed the “Paddington Shard”. 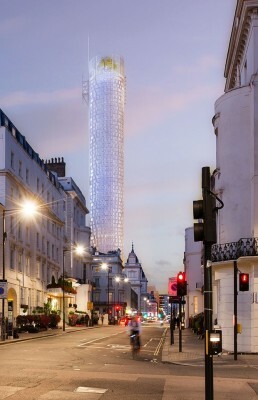 The Skyline campaign had opposed the proposal to build Paddington Place, also nicknamed the “skinny Shard” or the “Paddington Pole”, because of the impact it would have on views in the capital. Westminster Council said on Saturday that Sellar would reconsider the plans following concerns raised by campaigners and Historic England. The council’s planning committee had been due to vote on the scheme on 8 March. The Victorian Society is strongly objecting to plans to demolish the former Royal Mail sorting office to build the 72 storey ‘Paddington pole’. They claim, “The proposals entail the complete loss of the existing handsome building and would cause ‘substantial harm’ to the setting of nearby listed buildings and the conservation area. Locating a 72 storey tower in this low rise area would have a negative impact on large parts of West London, changing their nature forever. The Society is urging people to object to the proposals before the end of January. The impressive baroque style former Royal Mail sorting and delivery office was built in 1892 by Sir Henry Tanner, and extended in 1907 by Jasper Wager. The building sits alongside Grade I-listed Paddington station and features prominently in views both of, and within, the station. More criticism, from Historic England, Skyline campaigner Barbara Weiss and the Leader of the Labour group on Westminster Council. At 254m, the Paddington tower would be one of the five tallest buildings in London. But campaigners believe the development is being rushed. Architect Barbara Weiss questioned whether improvements to public spaces and services should be provided by property developers. Adam Hug, leader of the Labour group on the Tory-controlled Westminster Council, said the scheme was progressing “far too fast” and complains about the small amount of affordable housing. Architect Ed Jones of London architecture studio Dixon Jones has also waded in against the skyscraper. Plans for a 72-storey skyscraper at Paddington Station have been criticised by one of Britain’s leading architects, reports The London Evening Standard today. Sir Terry Farrell, whose offices and home are close to the mainline station, described the scheme from architect Renzo Piano and property firm Sellar as “opportunistic” and “piecemeal”. In a strongly worded 1,500-word letter to Westminster council, Sir Terry said he had supported the London Bridge landmark but that the new tower was at a “much more sensitive site” near Royal Parks, listed buildings and residential conservation areas. Sir Terry Farrell led a government review of architecture in 2015. Renzo Piano Building Workshop (RPBW) were the architects of The Shard. 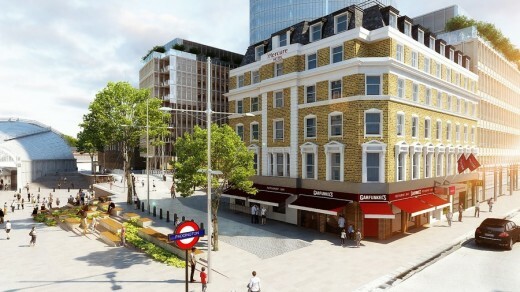 Great Western Developments Ltd, a subsidiary of Singaporean publicly listed Hotel Properties Limited, and its development partner Sellar Property Group today announces it has formally submitted a planning application for the redevelopment of the former Royal Mail sorting office at 31 London Street, situated adjacent to Paddington Station. The proposed development has been designed by one of the world’s finest architects, Renzo Piano Building Workshop, and will dramatically transform this part of London. It is proposed that the development will be known as Paddington Place. The multi-use scheme will deliver over an acre of new public realm. 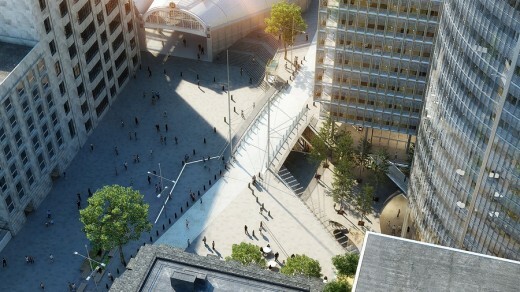 It will include a well-designed elegant piazza, transforming the area and creating a true sense of ‘place’. 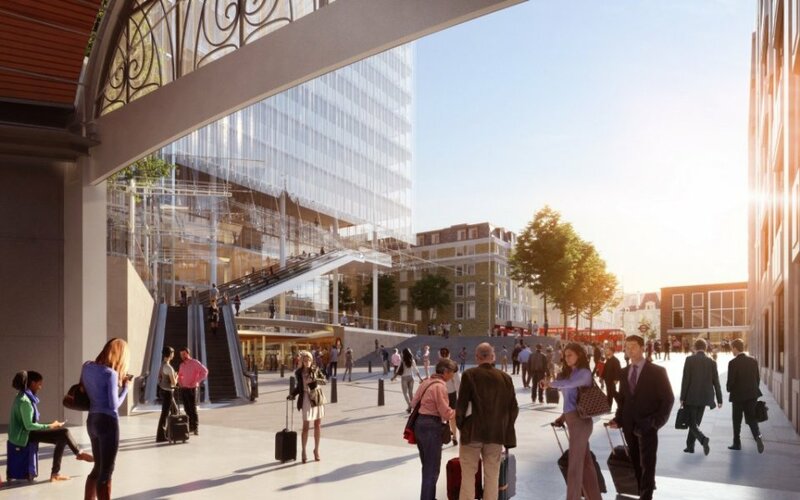 The centrepiece will be a new landmark for London, a crystal light-reflecting tower set to become a major marker for Paddington, one of London’s most important transport hubs. It will include a sky garden and restaurant, featuring mature trees and plants in the open-air, creating a unique experience for visitors. The ramp that serves as Paddington Station’s entrance will be removed and the whole area in front of the station opened up. There will be the opportunity to extend the station concourse into generous new public open space, benefitting the tens of thousands of passengers that use the station each day. The piazza will improve connectivity and establish a new ‘front door’ for this famously designed Brunel station. To improve the rail passenger experience, a new and enlarged Bakerloo Line ticket hall (approximately four times larger than at present) will be created and illuminated by natural light from vaulted glass ceilings. 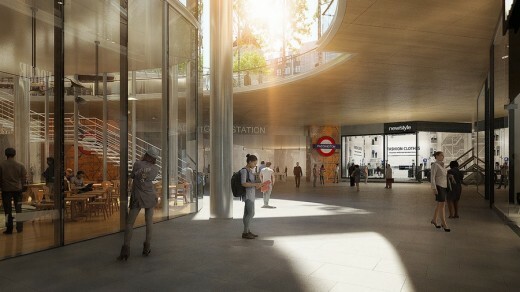 Connectivity to the Circle/District and Bakerloo Line platforms will be enhanced, reached from a new point of access/egress, and will ease congestion from the entrance’s present, cramped location. As part of the reconfiguration, London Street will be realigned and augmented by an elegant suspension bridge. The entire scheme has been designed to provide enhanced linkages into the St Mary’s Hospital estate. The end of 2018 will see the opening of Crossrail, together with upgrades to stations, platforms, signalling and trains serving the M4 corridor to Wales and South West England – all of which aim to address the vast increase in passenger footfall through Paddington, which is predicted to rise to over 60 million per year by 2031. Following this 50% increase from today’s passenger numbers, the area needs to be revitalised if its built environment is to appropriately reflect the significance of this key gateway, and to adequately support Paddington Station’s developing importance to London. There will also be 100,000sq. ft. of office space, with floorplates specifically designed to accommodate small to medium sized high-growth industries. This development will be further enhanced by 50,000 sq. ft. of high-quality retail and leisure space at Praed Street, rail concourse and tube station levels, which will breathe new life into the area.